After upgrading Parallels Desktop to version 10, I see that when my virtual machine is running, two Parallels icons appear in the Dock instead of one: one for Parallels Desktop and the other for the virtual machine. 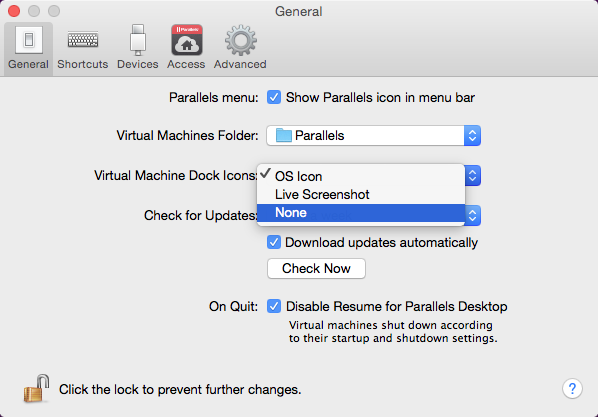 Go to Parallels Desktop > Preferences > General Tab > Virtual Machine Dock Icons. Note: since the release of Parallels Desktop 10 for Mac build 10.1.2 (28859) you can disable virtual machine icon in the Dock. 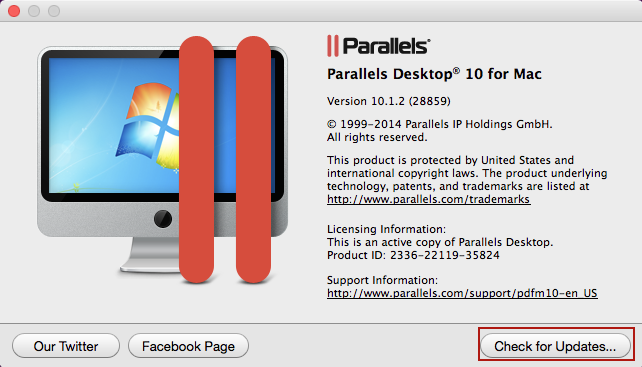 If you are not sure what build of Parallels Destop 10 is installed on your Mac, go to Parallels Desktop menu > About Parallels Desktop. Hit Check for Updates button if you need to update your installation. Note: Currently, this option is available only when your MacBook is plugged into the power. "Virtual Machine Dock Icons" option is greyed out.